A black and white negative of trenches dug by Whitby Hydro at the northeast corner of Brock Street and Dundas Street. 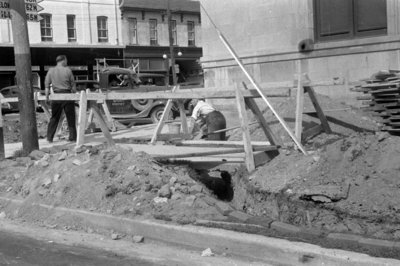 In this view a man is in the right trench and there is a man standing on the sidewalk. Whitby Hydro Trenches, August 1939, Marjorie Ruddy. Whitby Archives A2013_040_048C.